Although it hasn’t really felt like it lately, the truth is that we’re smack dab in the middle of winter here in Littleton. If you’re new to the area, you might be thinking that the reports of how much snow Colorado gets have been greatly exaggerated. We can’t say we blame you! The truth, however, is that the snow will come, and when it does, the experience you’ll have while driving will be significantly different. Not to worry though, because the team at Summit Riverside Apartments is here with some advice! Our goal is to make the tenants of our Littleton apartments feel safe at every turn, but the fact is that driving in the snow and ice can sometimes be a little bit counterintuitive. That’s why in today’s post we’ll be sharing a handful of tips for staying safe when the weather takes a turn for the worst. If you’re new to the area and you’re wondering what it will be like to drive in the snow, keep reading to learn more. If you know snow is coming, plan accordingly. What we mean by that is that if there’s snow in the forecast, you should make it a point to wake up earlier than usual and get out of the house earlier than usual as well. As you probably know, driving in inclement weather is probably going to take longer. How much longer it takes is, of course, dependent on what the conditions are like, but generally speaking, it’s never a bad idea to give yourself more time than you think you’ll need. Other things you can do to plan ahead include making sure the tread on your vehicle’s tires isn’t wearing too thin. A quick and easy way to do this is by using a quarter. The rule of thumb is that your treads should be at least ⅛” thick. To use the quarter, simply place it in the tread. If the top of President Washington’s head is covered, you should be good to go; if that’s not the case, you’ll probably want to get your tires replaced to make your car safer in the Colorado snow. The absolute best advice you’ll get about driving in the snow is to go slow. Yes, there are plenty of giant pickups out there that barrel along at insane speeds. That’s their decision, and frankly, it’s a poor one. Even if your car has four wheel drive, that doesn’t make it immune to slipping and sliding. You’ll need to change the approach you take to driving, and you should do everything from accellerating gently to braking more slowly. Additionally, you should give the other drivers on the road significantly more space. At the end of the day, the goal is to feel in control of your vehicle. If you don’t, slow down. Another important piece of the puzzle is to ensure that your vehicle has what it needs to get you through these unusual road conditions. Our advice is to keep it stocked with a good ice scraper. Don’t skimp out either. Although in many instances you can get by with purchasing cheaper items, investing in a good ice scraper will pay off as you’ll be able to use it for many years to come. You should also plan to keep extra gloves, a blanket, a stocking cap, some snacks, and bag of gravel to help with traction in case your vehicle gets stuck. As the old saying goes, you’re better safe than sorry. It’s also never a bad idea to check on your car’s fluids if you know a storm is coming. For example, if snow is expected on a Tuesday, fill your tank with gas on Monday. You can also add windshield washer fluid, check your battery, change your wiper blades, or check your oil. Skidding around on the ice is a common occurrence when the roads are snowy, and figuring out how to deal with skidding can be tricky. The Art of Manliness has an article on how to recover from five types of skids that is sure to come in handy. 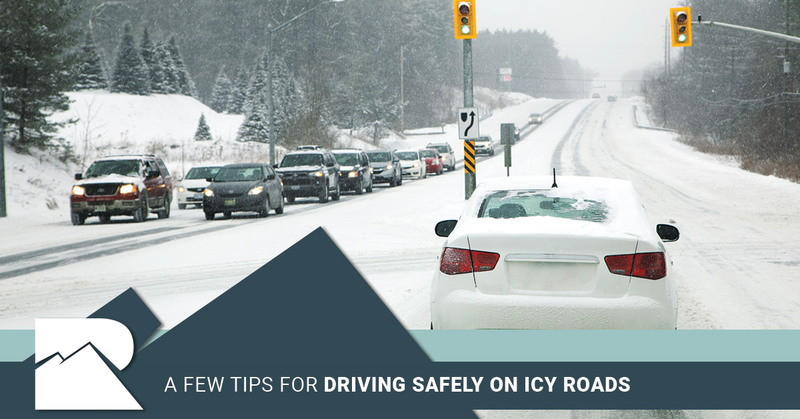 As the article notes, “In general, if you stay calm, restrain yourself from making drastic movements, and follow the tips [in the article], you’ll be able to safely travel the nation’s highways and byways throughout the winter months.” Knowledge is power, and learning how to deal with slippery roads will help to keep you safe. Of course the best way to stay safe in the snow is to simply stay home. If you don’t feel comfortable driving in the snow, the best advice you’ll ever get is to ask to work from home or call in to work to tell them the roads are too bad near your home. As the old saying goes, the best offense is a good defense, and your best defense against the rough roads — and other drivers on the roads who might not be as committed to driving safely as you are — is to avoid them entirely. Looking for a Place to Live in Littleton? As beautiful as the snow is, getting around in it can be quite the challenge. The good news is that Colorado’s countless other benefits more than make up for that inconvenience. And speaking of benefits, the amenities you’ll find at Summit Riverside Apartments are designed to help you allow our great state to the fullest. There are plenty of nearby bike trails, and you’ll be close to some of Colorado’s most beautiful locations. There’s also a new clubhouse, 24-hour fitness center, internet cafe, outdoor heated saltwater pool, basketball court, covered parking and garages that are available, and more. Inside the apartments you’ll find stainless steel appliances, full-size washers and dryers, designer flooring, wood-burning fireplaces, patios and balconies with storage, and more. Oh, and our apartments are also pet-friendly! There are a number of floor plans to choose from. Prefer a 2-bedroom apartment? Perhaps you’re in the market for a 1-bedroom apartment. Either way, we have you covered. We strive to offer the best luxury apartments in Littleton, and our goal is to provide you with a living space that you’ll absolutely love. Colorado is a wonderful place to live, and our apartments are designed to help you make the most of the fact that you live in such a wonderful state, so take a look and request a tour today to come see for yourself. Already know that this is the place for you? Click here to apply now!